Om’s exploration of spiritually resonant drone continues. Advaitic Songs takes its title from a reference to the Hindu school of thought regarding the self and a greater whole, and the band’s fifth album (second to be released through Drag City) is their most sonically expansive yet, the sense of communion that’s been imbued into their work since 2005’s Variations on a Theme no less prevalent for the lushness it’s grown into over the last seven years. Bassist/vocalist Al Cisneros (also Sleep) is the constant factor, and drummer Emil Amos (also Grails) has been aboard since 2008, but new to Om’s last album, 2009’s God is Good, was the tentative inclusion of multi-instrumentalist Robert Aiki Aubrey Lowe (also Lichens), who added tambura and backing vocals to flesh out songs like “Thebes” and the two-part “Cremation Ghat” closing duo. Lowe, now a full-time member of the band, seems to have had a liberating effect on the band’s sound, which feels limited now either by genre or some perception of what it’s supposed to be. The five tracks/43 minutes of Advaitic Songs hold fast to Om’s always contemplative sense of aural journey, but whether it’s Jackie Perez Gratz of Grayceon’s cello on “State of Non-Return” – a gorgeous accompaniment for Cisneros’ bass, Amos’ drums and Lowe’s piano that appears several times here throughout – or the beginning chant that sets the mood of opener “Addis,” it’s readily apparent right from the start of the album that Om have shed the minimalism that was so much a marker of their earliest work in favor of a richly atmospheric psychedelia that is, among other things, entirely their own sonically. 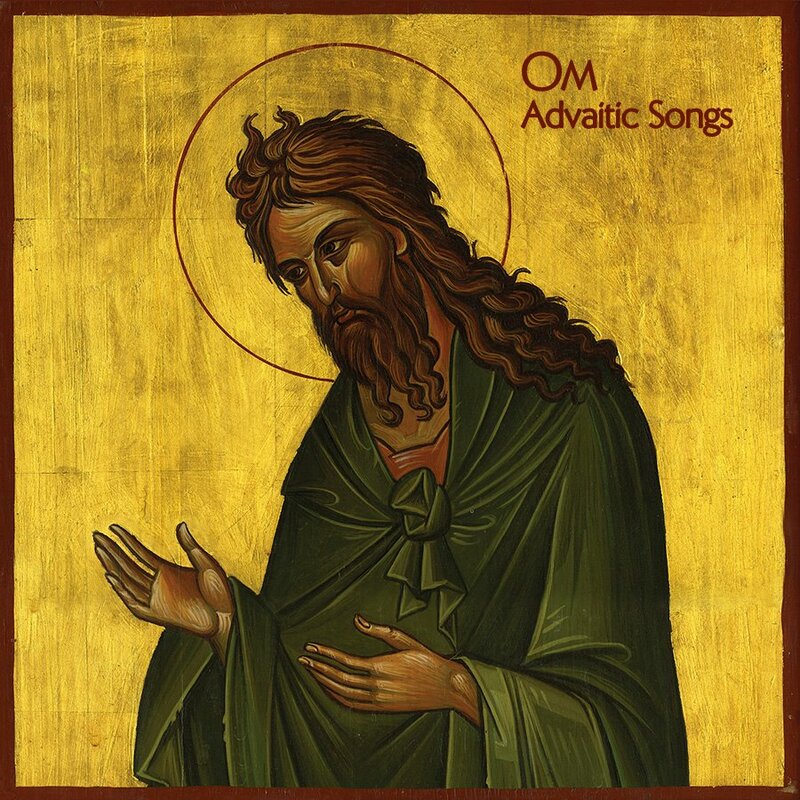 Simply put, there isn’t another band that sounds like Om do on Advaitic Songs – yet – and the grace which with they execute this material, coupled with Steve Albini’s production, gives the album a sense of mastery that wasn’t there either on God is Good or its 2007 predecessor, Pilgrimage. As the latter was the last album Cisneros made with former Sleep drummer Chris Hakius and God is Good the first with Amos and the introduction of Lowe to the recorded incarnation of the band – he’d done several tours with them already, if I recall correctly – it makes sense to think of Advaitic Songs as, if not an arrival (which would negate the sense of transience both in the music itself and in terms of the shifts that have gone into its creation; they are anything but stagnant), then a landmark along the way of Om’s continuing journey. And whatever the root cause is for the trio (it still feels strange thinking of Om as a three-piece) to move in this more lush direction, unquestionably at least some of the shift is a result of the lineup involved. Amos has long explored a wide variety of sounds and styles in Grails, but though his drumming on Advaitic Songs, much of the textures across these tracks seems to be traceable to Lowe, who plays the x-factor role well, adding piano here, guitar there, vocals here and, in the second half of “Addis,” following Gratz in a descending progression that sets a bed for the chanting vocals – either a sample or a guest performance – that telegraph the notion that though he’s the lone original member at this point, Om is not just about Cisneros, but about the whole of the band. In fact, but for a minimal bass line that follows the patterning of some of the percussion, he’s barely there at all, and it’s not until the more distorted tone of “State of Non-Return” kicks in that the bassist really makes his presence felt. That’s not a negative for the record, however, since the mood that the opener sets is so vivid, and “State of Non-Return,” though it’s probably the heaviest-sounding song Om has ever made, keeps that mood always at the fore. The cello provides an instrumental chorus, but the song revels in its heft in its own subdued way, working counter to the idea of “heavy” as an intangible aspect of creation which Om has always conveyed in their atmospheres – that is, “heavy” without the crush – but not really contradicting it, as the wavy groove of “State of Non-Return” will be immediately familiar and recognizable to anyone who has experienced any of Advaitic Songs’ predecessors or seen the band live. It’s just fuller, which, again, could be and probably is on some level a result of the added personnel, i.e. Lowe and Gratz, who feel no less committed to the overall vibe of the record than do Cisneros or Amos. However much Cisneros is a focal point for Om because both of his massive influence as a part of Sleep and the considerable impact he’s had with this project already to date, Om is now a full band and Advaitic Songs is a full-band. Parts of it are damn near orchestral. Even those that aren’t find their scope advanced. “Gethsemane,” named for the Jerusalem garden in which Jesus is said to have prayed the night before his crucifixion, launches a trio of 10-minute-plus tracks that to varying degrees nod at what Om used to be while affirming and expanding what they are now. The song makes a fitting centerpiece in terms of the tracklisting on CD, and patiently unfolds its complex arrangement of strings, piano, bass and Amos’ splashing cymbal counts and tom fills while chants echo as part of the ambience and a drone takes over until once more Om include a familiar drum progression soon to be topped with Cisneros’ bass and more forward vocals. However often imitated it’s been, his patterning is still distinct and his voice remains one of the telltale defining elements of this band. In highlighting this, and in bringing together the relatively newfound lushness in their style with the “classic” elements (in quotes because it’s really only been seven years) of Om’s sound, “Gethsemane” makes for Advaitic Songs’ most effective stylistic blend, capitalizing on the ambient foundation the first two tracks have set and also pushing ahead into yet-uncovered ground. It’s the kind of song you want to live in for a while, its warm tones remain inviting and significant-sounding, the cello adding a sense of drama to the headiness. There’s a sense of build as well, and an apex plays out in its way, but no matter how many elements are working at the same time, they never really let go of that contemplative feel. Om’s always been as much about the mood of the songs as the songs themselves – the parts functioning in service to a greater whole – and in that way, the latest outing proves more than aptly named as “Gethsemane” transitions to the melodic synth drone beginning of “Sinai,” the intro of which does little to convey its actual course. There are layers of psychedelic sub-swirl, more like just an infinite ringing note explored in waves, and then, as though from a megaphone or a tape loop, a sample chant begins. At 3:01, the chanting cuts off and Cisneros’ bassline begins, quietly, to set the basic rhythm that Amos will follow on the drums, and though that ringing drone remains (presumably it’s Lowe responsible, though Amos certainly has experience in this regard as well), the cello adds flourish, in terms of its general course, “Sinai” is probably the most characteristic of what’s generally thought of as Om’s style – at least rhythmically. The vocals come in short interjections that emerge as part of the swaying groove, and while both they and the bass are ultimately in service to the song itself, it’s Amos’ creative drumming that most shine near the end of “Sinai,” pushing out engaging fills even as they fade and the line of drone that’s been a constant throughout the 10 minutes preceding comes to the very front and then itself is gradually brought to silence. Then, finally, the mantra. At 11:25, “Haqq al-Yaqin” is the point at which the chanting moves from being sampled to actually coming from the band itself. Perhaps this shift between the last cut and the four preceding it is meant to be a part of an overarching internalization, the process through which this spirituality and ritual becomes the basis for existence (the song title offers few clues in this regard, being related to the rejection of everything in existence and the resultant destruction) and the fact that the lyrics and titles throughout the album have incorporated themes from Sufism, Hinduism, Christianity and Buddhism only furthering the notion of oneness, but that’s conjecture and there are arguments just as easily to be made to the contrary, however evocative these songs of the self and the whole might be. Amos keeps time on his ride while the chant serves as the chorus, Gratz’s cello soon layering in for a movement that’s cinematic and a contrast to the almost-whispered verses that follow. Shortly before eight minutes in, as part of a lengthy instrumental ending, an acoustic guitar is introduced and the effect is striking. Like the cello, it too works in layers, and gradually all of these piece come together in one beautiful sway that would’ve seemed impossible back around the time of Variations on a Theme or 2006’s Conference of the Birds. It is easily the fullest-sounding movement – a culmination without any of the bombast that usually accompanies such a thing – of Advaitic Songs, and perhaps also of Om’s discography to date. Maybe that’s not a fair comparison, however, because in that regard, Advaitic Songs is on an entirely different level than anything they’ve ever offered before. And again, because the album is current and they haven’t yet followed it with anything else, it’s easy to read this as something of an arrival at what the last two albums were driving toward, it seems far more likely that Advaitic Songs will serve as another step in the band’s ongoing, ceaseless evolution. I’ll be particularly interested to see if Gratz follows Lowe’s course and tours and becomes a full-time member of the band – she adds a lot to this material – but even if not, the work here speaks for itself. Om persist in crafting personal statements out of the intangible, and Advaitic Songs makes fools of those who’ve been unable to acclimate themselves to their growth over the last half-decade. It is luminescent. This entry was posted	on Monday, August 13th, 2012 at 1:42 pm	and is filed under Reviews. You can follow any responses to this entry through the RSS 2.0 feed. You can leave a response, or trackback from your own site. Wow! Great review! The “interfaith dialog” the Om delivers is truly unique, as well as their music. Have to check at the post office to see if my copy arrived! Cheers! H.P., you hit more than just one nail on the head here. Great review, great album! IMO OM has reached new ground here especially with the cello. I can’t get enough of it. It’s dramatic without loosing the meditative aspect AND without being crude in a Wagnerian way. Well played, OM! This has been the most comprehensive and honest review of this album I can imagine. I’ve just discovered Om, and it has been quite a musical revelation to me. Amazing. And you have put into words many of the feelings I had but could not express abut this marvelous music. Besides, you’ve given me more information about the band that any other reading I have found. For you excellent style and great review, thank you.